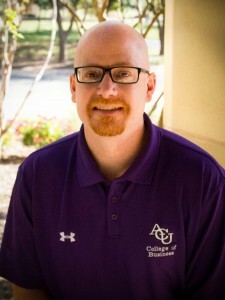 If you go to any ACU home game, you are sure to see Dr. Jonathan Stewart, finance professor, sitting in the stands or standing on the sidelines, cheering on the Wildcats. This year, Dr. Stewart is ACU’s Faculty Athletics Representative (FAR). FARs are chosen to help create a caring and supportive campus environment to grow and advocate for student-athletes. The FAR is involved in helping make sure that student-athletes have the appropriate systems and environments in place so that they can succeed in academics and as a person. Working as ACU’s FAR certainly aligns with Dr. Stewart’s calling to mentor and teach. It allows him to know and interact with a much bigger group of students, all with different concerns, majors, and backgrounds. “I am still learning and trying to find my way,” said Dr. Stewart. “It is fun to say hi to people while I am walking around campus or checking up on how things are with students in the Bean or in chapel.” Dr. Stewart tries to practice mindful prayer for the student-athletes. For example, there always injuries and physical struggles in athletics, so when Dr. Stewart sees someone in a brace or on crutches, he says that he prays for their healing and peace. “It can be stressful for an injured athlete to not compete and be with the team. I try to be really intentional about praying for them and following up on that,” says Dr. Stewart. Student-athletes also have to be exceptional time managers to succeed in the long run. Dr. Stewart prays for their ability to be well-organized and uncommonly focused and makes sure to be available to help students achieve those goals. Be sure to come say hi to Dr. Stewart at all of our home games and cheer on our student-athletes. Go Wildcats!